Through the restoration of San Diego’s Old Police Headquarters, the city has reclaimed a majestic urban treasure by offering an extraordinary new experience; a delightful destination where restaurants on the order of Puesto & Eddie V’s and specialty boutiques such as Kitson can make a lasting impression. 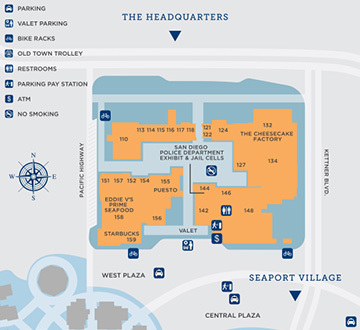 The Headquarters offers a free shopping shuttle for day visitation cruise ships. Shuttle picks up at the cruise ship terminal and drops off on Harbor Drive in front of The Headquarters at Seaport. Shuttle runs every 15 minutes from 9:30am-4pm.